Click HERE to download OGG to MP3 Converter first. Double click on the downloaded OGGToMP3ConverterSetup.exe file to run the installation wizard, like other programs, this wizard will introduce you to install OGG to MP3 Converter step by step, you can choose the installation destination and add some shortcuts of OGG to MP3 Converter. 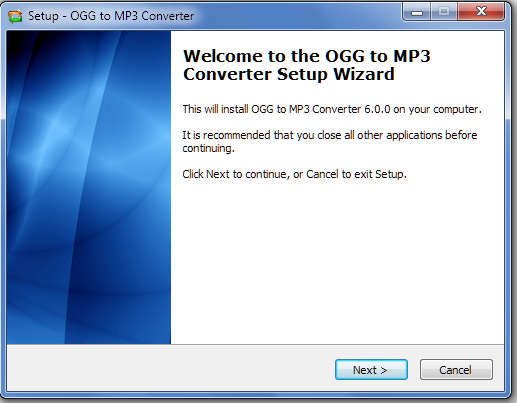 After the installation is finished, launch the application to start the OGG to MP3 Conversion. As an easy to use application, OGG to MP3 Converter supports three different methods to add your OGG files. 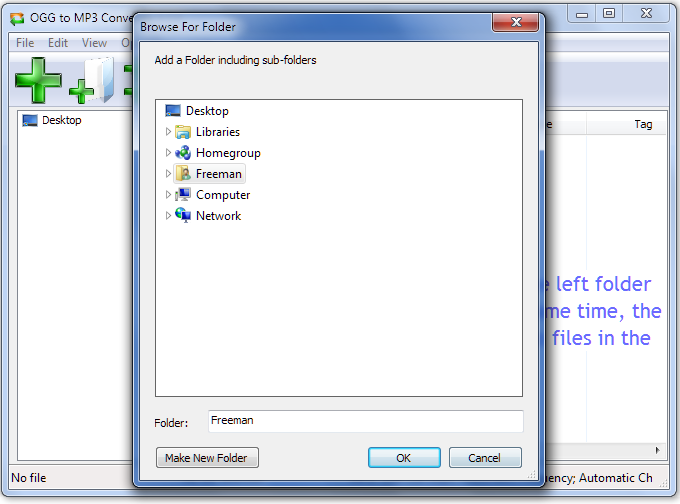 Click one of the Add File(s)/Add Folder excluding Subfolders/Add Folder including Subfolders menu items on the File submenu of the main menu. OR click one of the Add File(s)/Add Folder excluding Subfolders/Add Folder including Subfolders toolbar buttons to add OGG files. Navigate in the left tree window to the folder of your OGG files, OGG to MP3 Converter will search and add all of the audio files to the right pane. Drag & drop files and folders from the Windows explorer directly to the file list of OGG to MP3 Converter. Click the Option toolbar button to open the option dialog, you can specify the destination folder and set various encoder settings, for example, you can choose to leave the encoded MP3 files in the source folders or to a certain folder like the windows "music" folder. NOTE, "automatic" is the fastest & optimal way to convert, upmixing and resampling will NOT increase sound quality. 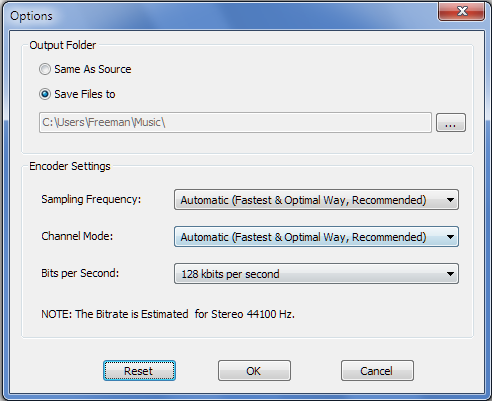 The higher bitrate you choose, the better the quality of the MP3 files, and of course, the destination file size will be larger. You can click the Convert toolbar button to start converting now. Or right click items in the file list and click Convert Selected menuitem to convert the selected files only. The application then will show your the progress window, you can see the progress, speed and ETA info on it. When you select one folder of the left folder tree, press the Ctrl key at the same time, OGG to MP3 Converter will search and add all audio files in the subfolders. When you select one folder of the left folder tree, press the Shift key at the same time, OGG to MP3 Converter will NOT clear the existing file list, in other words it keeps the added files. You can drag & drop OGG files from the file list to Windows Explorer to duplicate these OGG files. Right click items in the file list and click the floating popup menu to perform various file operations. Click the column header to sort the file list. Right click the column header and click the floating popup menu to show/hide columns.